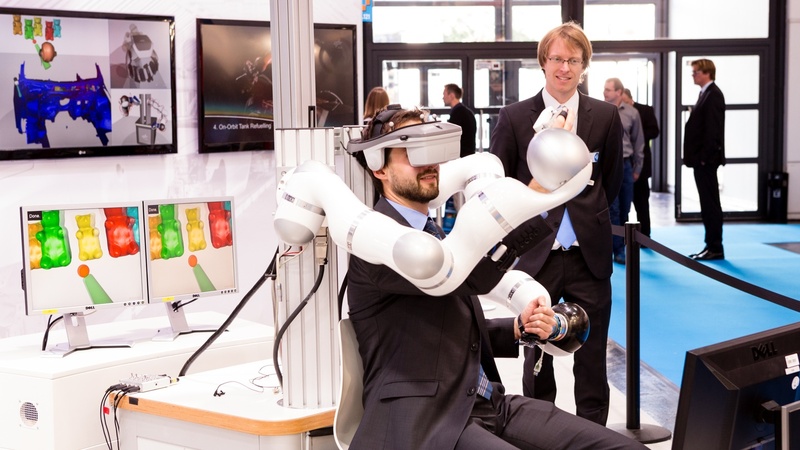 The Institute of Robotics and Mechatronics develops a wide array of robots to enable humans to interact more safely and efficiently with their surrounding environments. 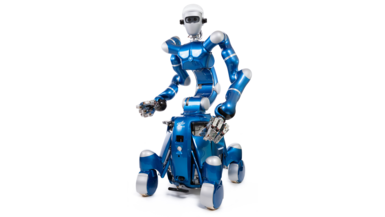 The robots are designed to act in surroundings inaccessible or dangerous to humans as well as to support humans in everyday life and work. Our robots mimic and extend upon the manipulation and locomotion capabilities of humans on a functional level. 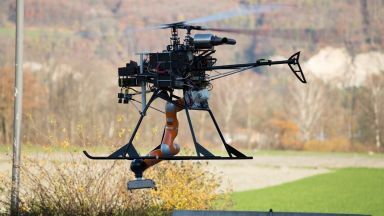 In a more general sense, they perform any tasks of locomotion and interaction with the environment with a wide range of autonomy to suit different tasks. As a key aspect for the usability of robots, we address the interfaces to humans through multimodal human-robot interaction. The research efforts around Rollin 'Justin investigate compliant whole-body motions and their effects on the environment. Exemplary everyday household tasks include window wiping, sweeping, or vacuuming the floor. 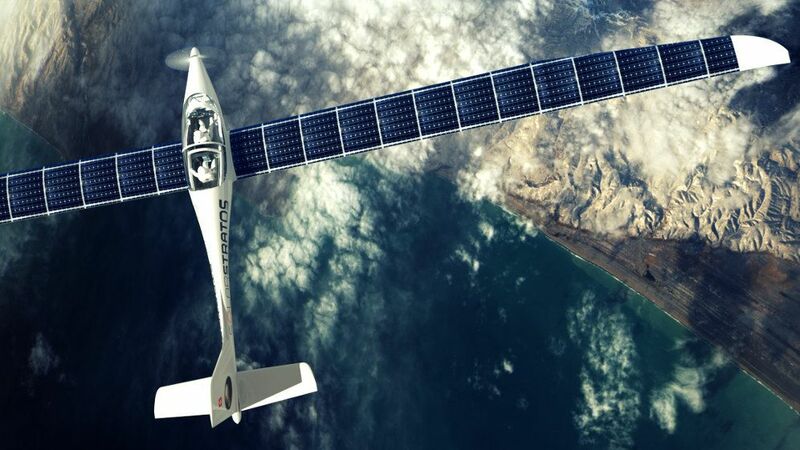 In the near future, high-altitude platforms could extend application fields presently covered by satellites and are therefore often named HAPS, which stands for high-altitude pseudo satellites. Possible applications range from establishing communication networks to long-term recording of weather and environmental data. The DLR Flying Robots group is working in close cooperation with Elektra UAS GmbH and SolarXplorers SA (Solarstratos project) on highly efficient drives, avionics components, as well as payloads and autonomy functionalities for autonomous and optionally piloted solar high-altitude platforms and missions. The LRU (Lightweight Rover Unit) is the prototype of a semi-autonomous robot for the exploration of the moon or Mars. It combines several of the latest technologies developed at the Institute of Robotics and Mechatronics such as the drive and joint units, the motors of which were already proven in outer space use for five years on the International Space Station in the ROKVISS experiment. Real-time telepresent and virtual interactions require haptic devices to realistically display forces to the user. 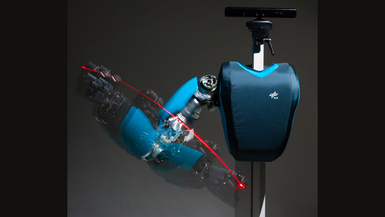 HUG is a bimanual haptic device composed of two Light-Weight Robot arms that are capable of generating highly dynamic interaction forces to the human hand. HUG is used to conduct research in various applications in remote and virtual environments, comprising telerobotics with SpaceJustin, virtual assembly verifications, rehabilitation tasks, and training of astronauts and mechanics. 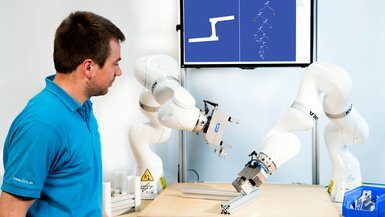 Manufacturing flexibility can be greatly improved by using cognitive robot systems that are able to learn. Such systems enable the automation of the assembly of single-unit products, as well as natural interactions with the human co-worker in shared workspaces. 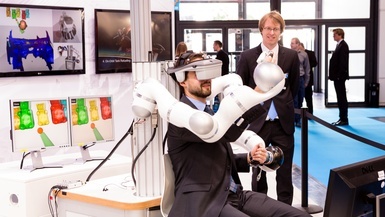 The picture shows a demonstrator for automatic and flexible assembly of complex aluminum structures with two lightweight-robot arms, which was developed within the EU-Project SMErobotics. Researchers within the DLR Flying Robots group have integrated an light-weight industrial robot arm with seven degrees of freedom into an autonomous double-rotor helicopter platform. The system is intended for automatic deployment and maintenance of mobile service robots with magnetic wheels, which are used for pipeline inspection. Similar systems could also be used for inspection and maintenance tasks in areas which are hazardous or otherwise inaccessible for humans. 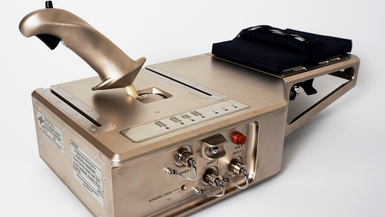 Force-Feedback Joystick for the International Space Station ISS—developed in the project Kontur-2. Astronauts onboard the ISS can telemanipulate robots on earth and are able to feel the resulting interaction forces from the robot on the ground. This enables the sensitive manipulation despite the large distances. Credit: DLR/Simon Schätzle (CC-BY 3.0). 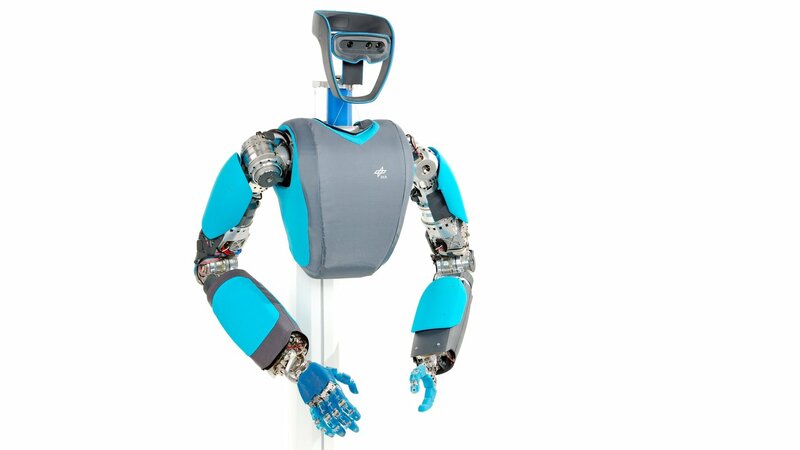 David is an anthropomorphic robot developed at DLR using variable stiffness actuators (VSA). It is intended to approach its human archetype in size, weight, and performance. The focus of the development is on robustness, high dynamics, and dexterity. People with physical disabilities, especially those affecting the upper limbs, are dependent on the help of others even for very simple daily activities. 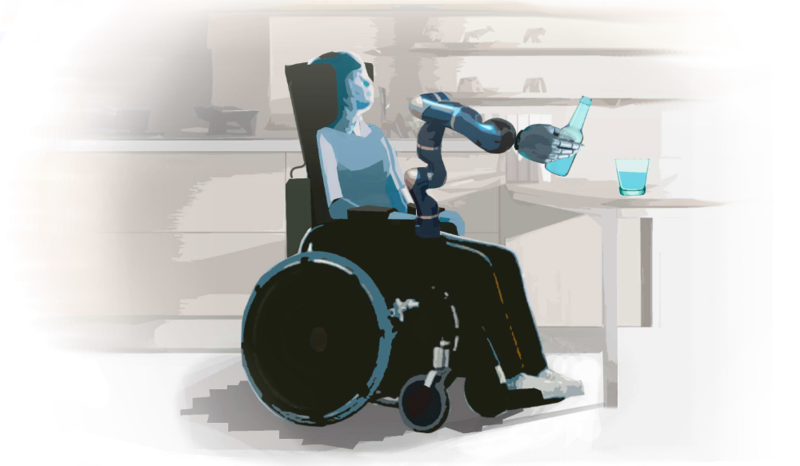 These people can be helped by robotic assistive systems in conjunction with a brain-machine interface to carry out such simple tasks autonomously and thereby increase their independence. For this purpose, we are investigating various methods to enable people with physical disabilities to control robotic arms. 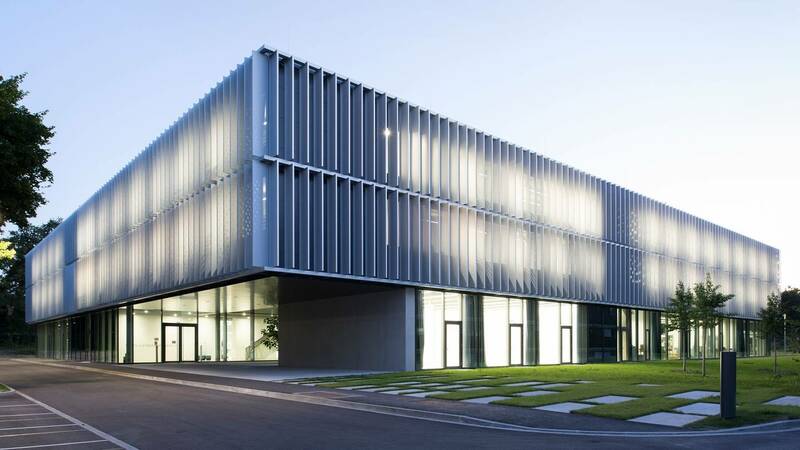 The Institute of Robotics and Mechatronics and the Institute of System Dynamics and Control moved into the new premises of the RMC in summer 2015. 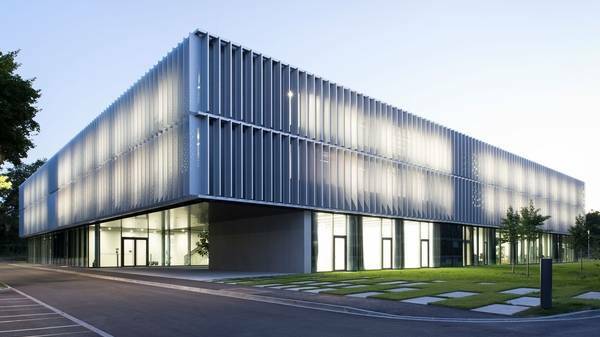 With space for 300 colleagues and 80 students, the new building will foster closer cooperation between the two institutes within the RMC. The low intrinsic damping properties of variable stiffness mechanisms lead to oscillatory dynamical behavior. A desired convergence behavior can be achieved by active damping control based on state feedback control and the system flatness property. The combination of active (impedance) control with passive elasticities increases the stiffness range and shape. 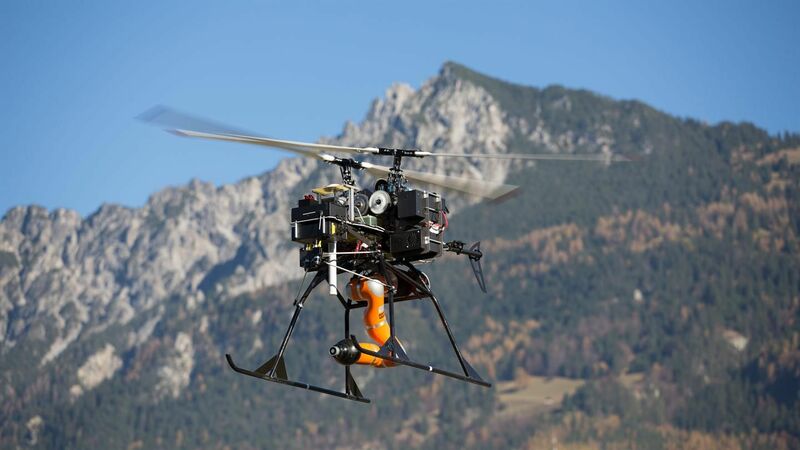 The key research area Flying Robots covers several domains of the DLR Robotics and Mechatronics Center – Aeronautics, Space, Robotics, and Optical Information Systems – in order to exploit synergies in the development of robotics technologies for autonomous flying platforms. The spectrum of our work ranges from low-level control and sensor data processing to mission planning and execution. The mobile humanoid robot Rollin' Justin is utilized as a research platform for autonomous dexterous mobile manipulation in human environments. In the future humanoid robots are envisioned in household applications as well as in space environments. The DLR AIMM is based on a mobile platform from KUKA and the KUKA LBR4+ extended with sensors and computers. 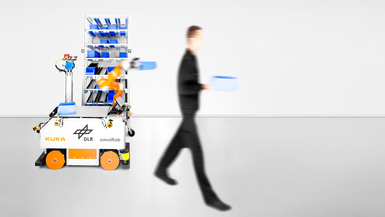 The goal of our work is a robotic system which is simple to use in real industrial applications utilizing its autonomy. Through the insights gained from the development of our robot concepts, we further aim to contribute back to the basic sciences with hypotheses for explaining biological phenomena. We are interested for example in the biomechanical principles of motion as well as in understanding of perception-action loops as they function in nature. 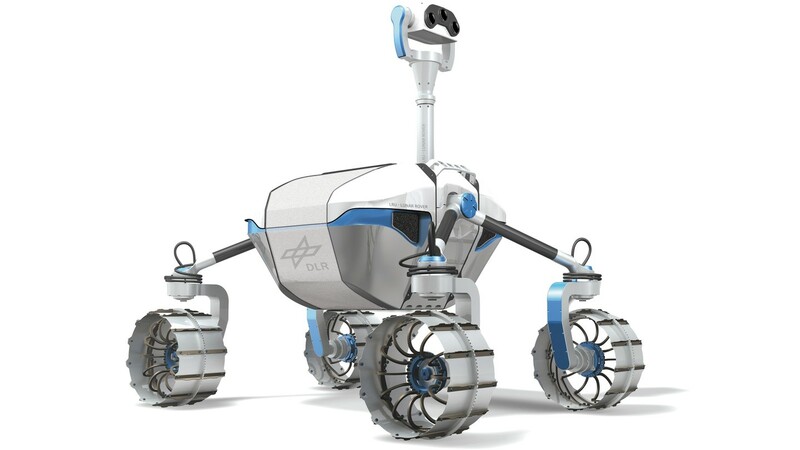 As a member of the German Aerospace Center, we are developing highly autonomous robots towards space missions for exploring remote planets, moons and small bodies of the solar system. 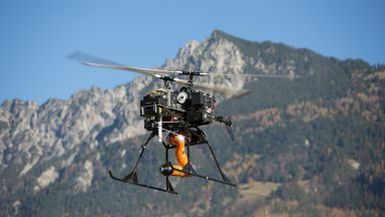 Robots are the only vehicles capable of reaching most of these targets in near future, due to their great distances from Earth and the hostile environments. On the other hand, for on orbit servicing, we are developing a variety of teleoperation capabilities, from full telepresence to high levels of robot autonomy in different human-robot cooperation scenarios. By enhancing productivity, robotics therefore contributes to preserving economic strength and welfare and addresses central health and workforce issues of the aging society.